Location awareness is becoming ubiquitous. With iPhone apps like Brightkite & Loopt, web apps like Flickr have embraced geo tagging and ability to search people or pictures by location has been around for a while. Most recently, Twitter added goetagging to the tweets so you can look up tweets by location. Where was this post written? Where is the commenter located? Are there other WordPress.com bloggers near you? How Do I Add GeoLocation? If you have a blog at WordPress.com, you can start attaching location to individual blog posts. This will let your readers search posts from specific places. Before you go whoa! why on earth would I want to do that, this is totally optional. If you don’t want to disclose locations, you don’t have to. Let’s say you want to use this feature you can start using it in one of 2 ways. If you have a Geolocation aware browser, then all you have to do is confirm the location it detects or you can override that to enter it manually. 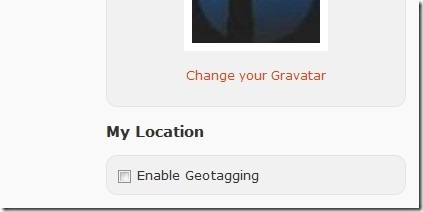 To start using geotagging, you have to go to Users -> Your Profile and enable it. Right now, this geo tagging is limited only to blog posts and profiles on WordPress.com. But, support for commenter location, poll votes location, a live map view of blog updates, an annual report showing where your posts were written and where your comments came from are on the anvil. Can I add GeoLocation to a hosted WordPress blog? Hosted WordPress has not gotten this as a native feature and I haven’t seen this listed in WordPress 2.9 new features. May be I missed it. But, you can get some of the geolocation features with a couple of plugins depending on the feature you are looking for. If you are interested, I have put all my favorite WordPress plugins in nice categories in a page – Top WordPress Plugins. If you are excited about geotagging, how do you see yourself using it in your WordPress blog? I think I’m one of those:”whoa! why on earth would I want to do that” people.